So much for the Harlem Shuffle. The Louisville Chef Shuffle is underway in at least three restaurant kitchens. • McCandless bids St. Chuck fair well: Patrick McCandless has left the executive chef’s spot at St. Charles Exchange for as of yet unknown reasons. 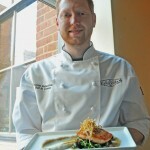 Longtime sous chef Tyler Powell has been promoted to executive chef. Patrick McCandless, executive chef at St. Charles Exchange, is amazingly calm discussing the details of his first James Beard House dinner on Feb. 27 in Manhattan. Cooking on one of America’s grandest stages—though the truth is there is nothing grand at all about the wholly non-descript place—is an event that gives many chefs fits, leaves them biting their nails and claims precious sleep in the days leading up to the dinner. Is the young lad simply naïve about the task before him? Isn’t the pressure of feeding a faction of New York’s culinary cognoscenti and some national magazine reporters bugging him? And what about cooking in the Beard House’s notoriously cramped and gloomy kitchen? It’s a far cry from St. Charles’ modern, clean and well-lighted space. McCandless is prepping some of the food for the 60-person meal in Louisville, vacuum packing select ingredients, and then trusting it’ll arrive by air on time and in the right place by Feb. 26.